Nelly loves Daddy Gnu. He can make a house out of an old cardboard box, some string, and some tape. They measure and draw, and tape and saw. But Nelly thinks it needs more. So off they go to the store. Nelly finds the perfect shade of blue and Daddy gets some brushes. And when Nelly drops her stuffed doll in the busy aisle, she gets separated from her Daddy… for just one scary minute. Daddy swoops her up and zooms her through the air. They pay for all their painting supplies, and go home to decorate her house. That night, Daddy Gnu cooks dinner and reads Nelly her favorite books, then they go to bed… inside her new cardboard box house. 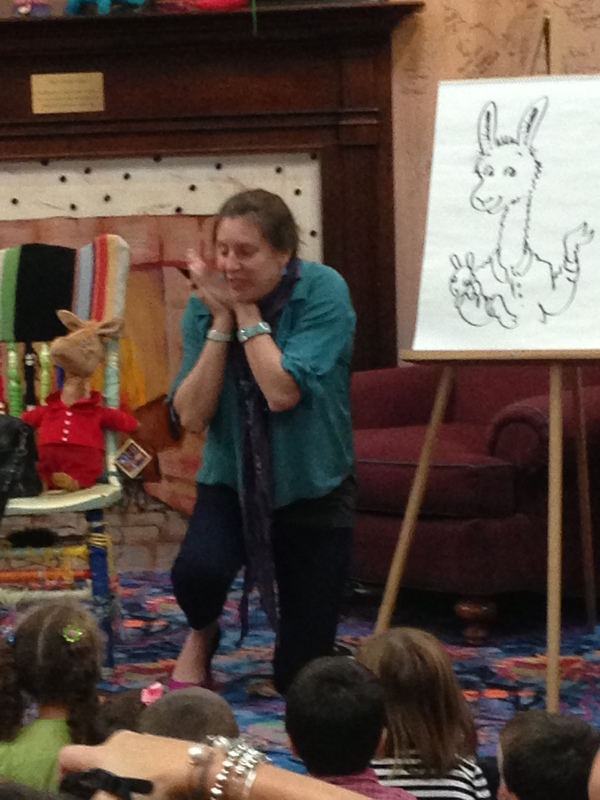 Anna Dewdney, author of the acclaimed Llama Llama series, has done it again. This little story is the natural blend of rhyme and tenderness. Anna Dewdney speaks to the heart of a three to five year old. She tells the story of a father/daughter relationship that is simple and warm. And her illustrations bring the reader right inside Nelly’s little world. A perfect anytime story. Nelly and her Daddy have a special bond. It’s a perfect compliment to Llama Llama’s relationship with his mother. This is a book I would recommend for any preschooler, and the fact that it’s available now for Father’s Day is even better. Share a copy with your special Daddy’s girl or boy. As promised… last week when I met Anna Dewdney at a book signing event in Cincinnati, I promised to review this book. Here it is. Sorry it took me a little longer than expected to write this review, but I do have a good excuse. It was my grand daughter’s third birthday this weekend. On the bright side though, I do have her reaction to this book as well as my own review! Llama Llama and the Bully Goat is a wonderfully written picture book for the preschool crowd addressing the issue of bullies in a realistic yet sweet way. Llama and his friends at school run into problems with billy goat who laughs at others, says ‘not-nice words’, and is mean on the playground. Llama tells the teacher and she has a talk with the class during circle time. By the end of the story the billy goat is singing with the rest of the class and everyone goes home happy. 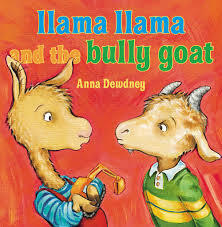 I liked that even though the billy goat was a bully goat, Anna Dewdney presented him as a character with flaws who is still likable. It’s so important that young children realize the difference between bad behavior and a bad person. She also presented a solution that little ones can implement in their own dealings with bullies or friends who can be mean sometimes. Little Juliana listened to this book so seriously! She repeated after me and asked ‘why’ on every page. She’s still at the why stage, so we had lots to talk about. She was so happy that the billy goat was nice and that llama and the billy goat were friends at the end of the book. “Read it again!” … highest praise for an author! So, from me and my grand daughter… two thumbs up! 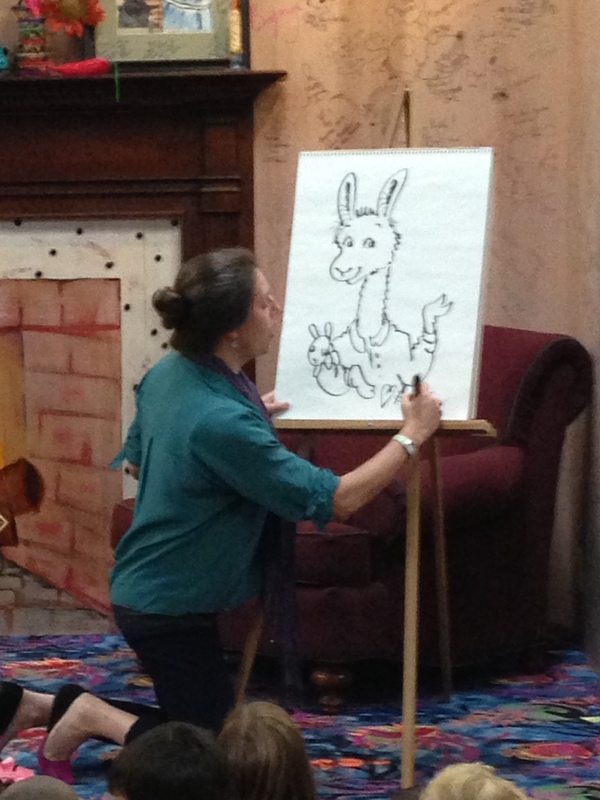 Anna illustrated her famous llama for the audience. I especially liked how she interacted with the little ones there. One little guy really wanted her to add the red pajamas from his favorite book! Here she is reading Llama Llama Mad at Mama. I loved how she introduced the story with the background that even the youngest participants could identify with. Can’t you tell how much she loves her job! The kids were enthralled, and so was I! 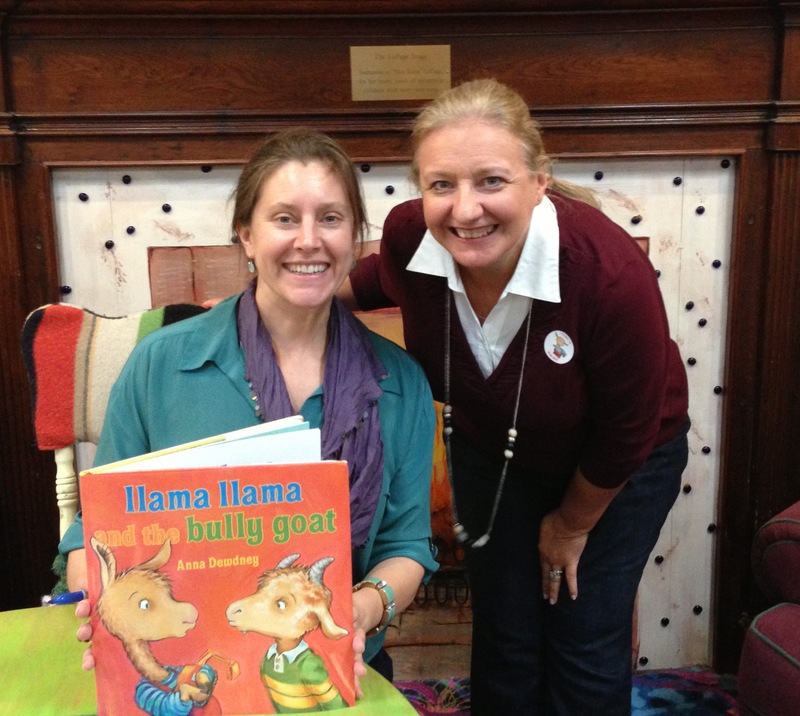 I got a chance to meet Anna Dewdney, author of the Llama Llama series this morning. 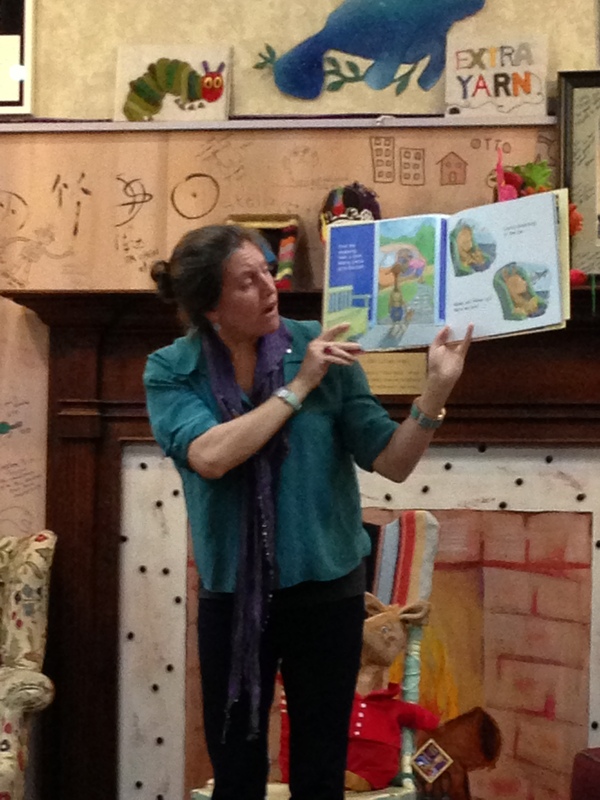 She was at the Blue Manatee Children’s Bookstore in Cincinnati drawing, reading, sharing, and signing with a packed house of little ones and their parents, grandparents, and caregivers. As you can see from the photos, she is multi-talented and engaging. The kids loved her and were eager to participate in the storytelling. Being the nice person that I am, and having an ulterior motive, I let all the people with little ones goes first. I grabbed a seat in the cafe and waited out the crowds at the book signing with a cup of coffee and a blueberry muffin. When the last child got their book signed and their picture take, I took my turn. I had three books signed, her newest book, Llama Llama and the Bully Goat for my oldest granddaughter, and two board books for my youngest granddaughter. And of course I had my picture taken also. Now for the ulterior motive… I got a chance to talk with Anna Dowdney about writing! She is so sweet and caring. She asked right away if I was a teacher, we have that in common. (Said she could tell right away!) But most importantly she gave me lots of advice and encouragement. She even gave me the name of her agent and told me to email her with any questions. How cool is that! I’m not too embarrassed to want my own picture take with a famous author!